Anyone who knows me knows I've had a long-time obsession with Indian food. As a practitioner of yoga and meditation, a student of ayurveda, a vegetarian, and a lover of all things Indian food, I sometimes think I was born into the wrong culture. Did you know an estimated 40% India's population are vegetarian? How cool is that? When we lived in LA we went on a date night to our favorite indian restaurant and ordered the vegetarian special for two literally every single week. I've attempted cooking Indian food at home for years to no avail. It seems to always take hours, use hard-to-find ingredients, and never end up even half as good as in the restaurants. Unfortunately, Chicago's indian food scene is limited to a small neighborhood over an hour from us on the far north side so I've given Indian food at home another shot. I've made this dish over and over and it's definitely restaurant-worthy with only a moderate amount of effort. Not only is it not filled with heavy cream (hello vegetable masala) but it's dairy and gluten free so everyone can enjoy. Notes: 1/2 teaspoon of cayenne makes for a rather mild to medium spiciness level. For no spice feel free to omit it altogether, for a hotter dish add more. As with all Indian food, this dish tastes better on day 2 than day 1. Something about the spices blending together. Heat a large saucepan over medium heat. Add coconut oil and heat until warm, followed by ginger and mustard seeds. Cook for about 4 minutes, stirring frequently. Stir in the leek and cook until it has softened, about 3 minutes. Add the almond meal, coconut, cayenne, and korma powder, and cook until the coconut begins to brown, about 5 - 7 minutes, stirring frequently. Sprinkle in half of the chickpea flour and stir until the mixture becomes a thick paste. Slowly pour in half of the stock, whisking constantly. Continue to whisk as you sprinkle in the remaining chickpea flour followed by the remaining stock. Continue to whisk for about 5 minutes until the mixture thickens to a gravy-like consistency. Reduce the heat to low. Stir in the coconut milk, lemon juice, tomato paste, and date and heat until the mixture is warmed throughout. Using an immersion blender, blend the sauce until it is smooth and creamy (alternately, transfer the mixture to a blender). Add a generous amount of salt (to taste) and adjust spiciness level by adding more cayenne if needed. Leave the sauce on low while you prepare the vegetables. Bring about 1 inch of water to a boil in a medium saucepan. Top with a steamer basket, making sure the water doesn't touch the basket. Meanwhile, chop the potatoes into bite size pieces, sprinkle with salt, and steam, covered, for 5-7 minutes or until tender. Transfer to the korma sauce. Repeat with broccoli and cauliflower which steam for about 2 minutes, mushrooms which steam for about 4 minutes, and bell pepper for about 2 minutes. 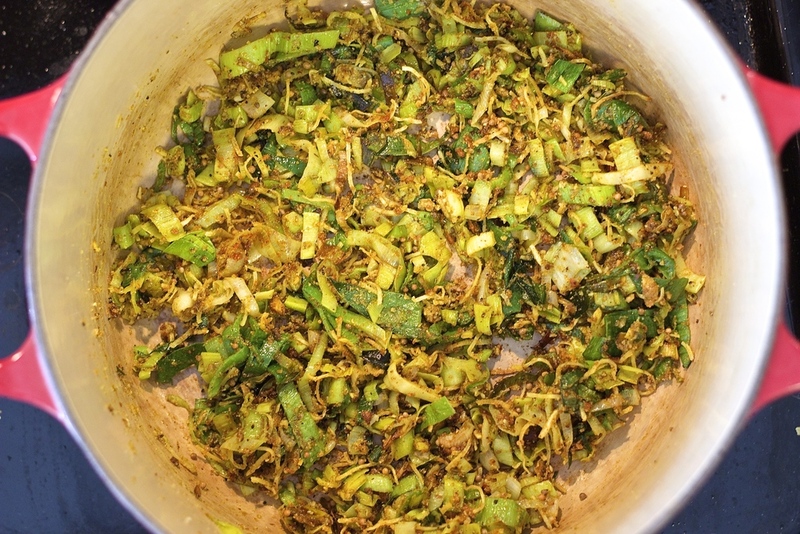 Transfer the vegetables to the korma sauce once cooked and then stir in the peas. Top the vegetable korma with chopped cilantro and serve with rice and/or naan bread. Place all the ingredients in a spice grinder or spice mill and blend to combine. 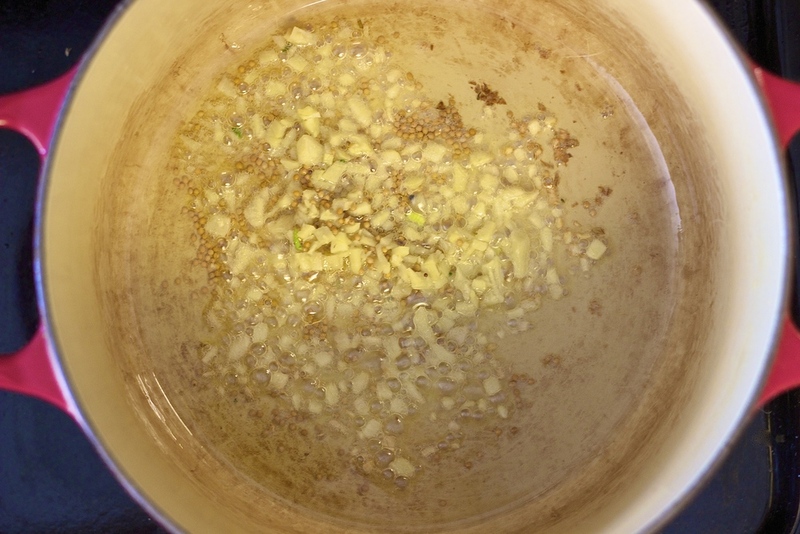 Alternately, grind the whole seeds into a power using a mortar and pestle then stir in the rest of the spices (I did it this way). Store in an airtight container. Notes: This makes about 1/2 cup of powder which can be used to make this vegetable korma several times, but feel free to half the recipe as well.